Protogo 4 is here - featuring TechTool Pro 7. You've come to rely on TechTool Pro to troubleshoot, diagnose, and repair problems with your Mac. With Protogo, TechTool Pro has another feature: portability. Do you have an old portable hard drive or flash drive lying around? Why not turn it into the ultimate Macintosh diagnostic, repair, and maintenance tool? With TechTool Protogo it's easy. TechTool Protogo allows you to create a bootable diagnostic device that contains TechTool Pro and all of its most powerful tools as well as any of your own utilities you may wish to install. You can then use this device to boot, check, maintain, and repair Macintosh computers as needed. TechTool Protogo ships with several Profiles that allow you to start up, test, and repair multiple Macs. Protogo allows you to add other utilities, including those you're used to seeing in your Utilities folder, to the devices it builds, giving you many more tools than your typical diagnostic DVD. Whether you have a fleet of Macs to maintain for your business, or simply have your family's MacBooks to look after, Protogo can give you access to all the tools you need. 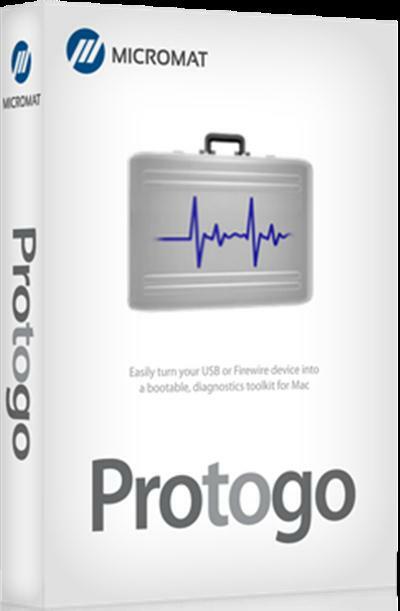 With your Protogo device, you can start up more Macs more quickly than with a traditional DVD, and have the tools to get more done.